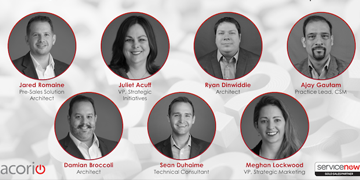 Our panel of 6 ServiceNow enthusiasts as share what they're looking forward to and what trends they see on the rise in 2019 and beyond for ServiceNow. 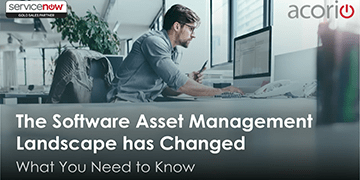 Join Carleen Carter, Acorio's Director of Technical Consultants and Solutions, as she presents The Software Asset Management Landscape is Changing: Here's What You Need to Know. 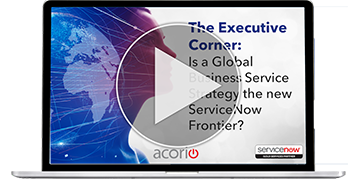 Is a Global Business Service Strategy the new ServiceNow Frontier? 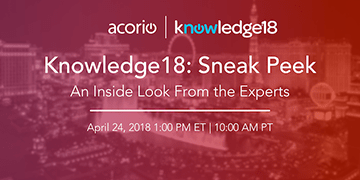 Knowledge18 is just weeks away and it’s time to start preparing. 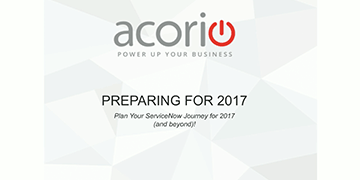 Join Acorio’s Experts on a panel discussion on what to expect at this once-a-year conference. 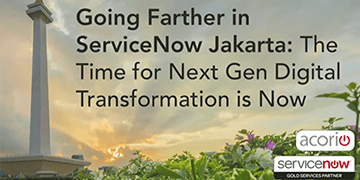 Highlights will include Customer presentations, new product-focused technology, and innovations as well as main themes we expect ServiceNow leadership to be sharing. 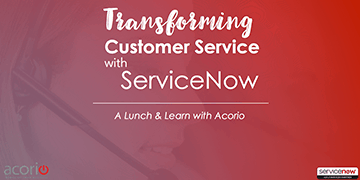 In our March Lunch and Learn our Customer Service experts will show how to use thoughtful, intuitive technology to solve customer issues at light speed., with real-world examples and a live demo. 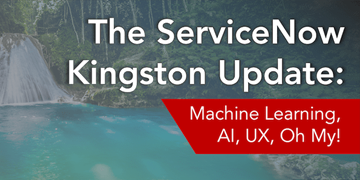 The ServiceNow Kingston Update: Machine Learning, AI, UX, Oh My! 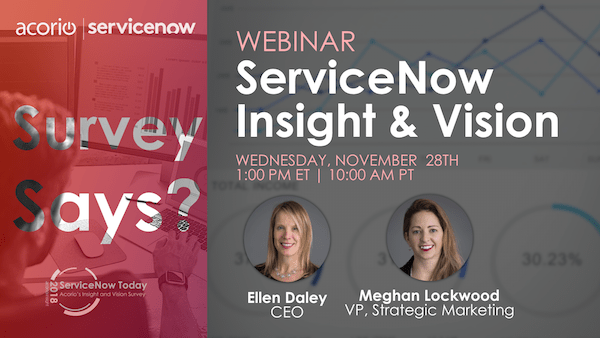 Join CEO, Ellen Daley, VP of Solutions and Innovation, Adam Mason, and Strategic Director of Marketing, Meghan Lockwood, to find out how to get the executive buy-in and prove your business case for Enterprise Service Management with ServiceNow. 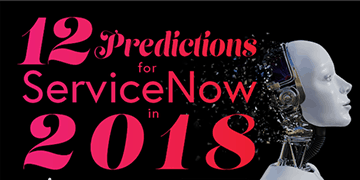 Our Experts Weigh In: What ServiceNow trends should you look for in 2018? Submit your own questions, network with peers online, and get key insights of what other companies are planning and prioritizing in 2018. 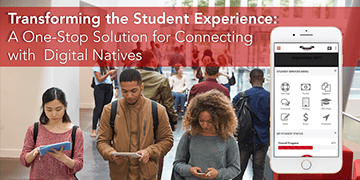 With its intuitive interface, ServiceNow helps higher ed institutions to step away from the dark ages of spreadsheets and un-trackable requests, and instead provide their students and alums with an organized and pleasant web experience. 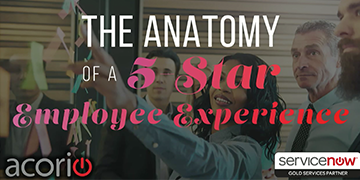 Our experts will cover ServiceNow's new product, HR Service Delivery, and help you understand the platform's onboarding experience and what success it can bring to your company's future (and current) employees. 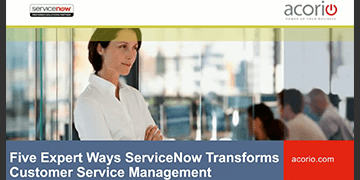 Join our ServiceNow Experts for a virtual conference on ITSM transformation. In 2017, you shouldn't be dealing with chaotic help desks or excel sheets. It's time to learn what you're missing. 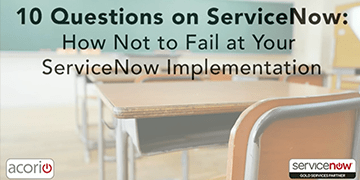 How Not to Fail at Your ServiceNow Implementation. 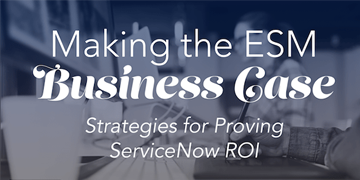 Get the answers you need to the tough questions about ServiceNow, then actually get started. 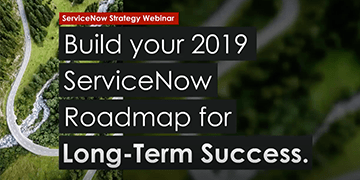 With ServiceNow launching their new Platform upgrade, you might be in the midst of deciding whether or not this upgrade will lure you in (if you don’t have the Portal yet, you might want to think about that!). 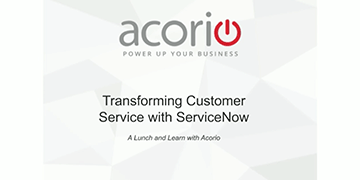 Join a panel of executives from ServiceNow, 3C Logic, and Acorio as they explore the challenges facing customers and executives alike, and explore the transformative results customers in the real world have driven using the power of the ServiceNow CSM platform. 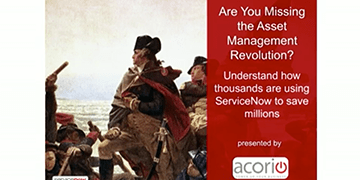 Join Acorio's CEO, Ellen Daley, and ITOM expert, Terrell Pursley for the ultimate run-down of ServiceNow's Service Mapping. 1. 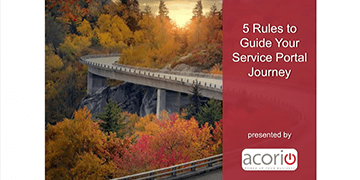 What is Service Mapping? 2. 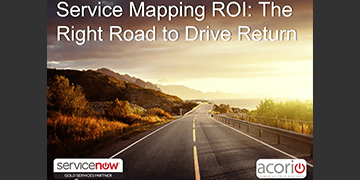 How does Service Mapping work? Learn the "crawls" and "gotchas"
3. How do you know if this is the right investment? 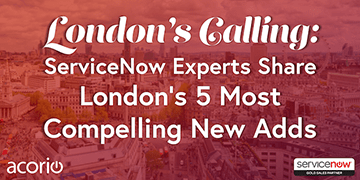 Knowledge17, ServiceNow's biggest event of the year, is just three weeks away. Join Acorio's Leadership Team on a panel discussion of what to expect at the fastest-growing enterprise cloud company's annual conference. Join Acorio’s leadership team members: CEO, Ellen Daley, and Vice President, Ross Rexer for an online web clinic on Wednesday, April 12th, 2017, 1:00 PM EST. They'll offer real-world examples of the three major ways the platform can add value to your business. 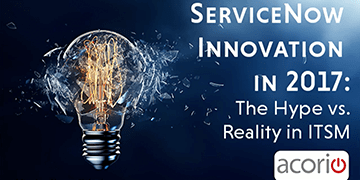 Join Acorio's Vice President, Ross Rexer, and Midwest Sales Manager, Dave Kruchten to learn how organizations are modernizing their IT Services with ServiceNow's best-in-class cloud-based ITSM. 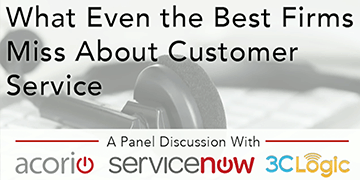 Adam Mason, one of Acorio's Vice Presidents, will walk you through Customer Service Management business challenges - All you need to do is enjoy your pizza! 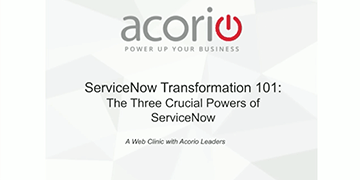 Additionally, within this webinar, we will showcase a demo of ServiceNow’s unique power to address these challenges. 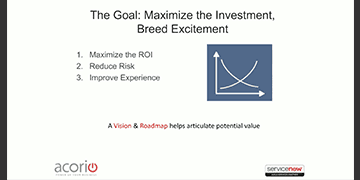 Are You Missing the Asset Management Revolution? Today’s competitive business and regulatory climate requires an intelligent, integrated platform to dramatically reduce costs and eliminate regulatory risk. A new single system of record offers real-time visibility into your company’s physical assets, contractual obligations and software licensing agreements. 5 Rules to Create a User Experience Your Team Will Love. 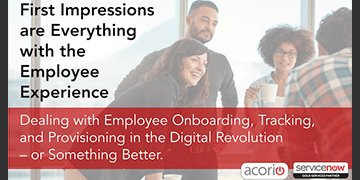 Acorio experts will showcase how your company can deploy modern web technologies (including mobile) to streamline your internal IT portals, to create an IT interface your employees will use and love. 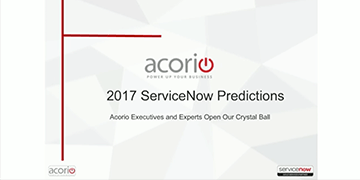 Are you prepared to maximize ServiceNow in 2017? 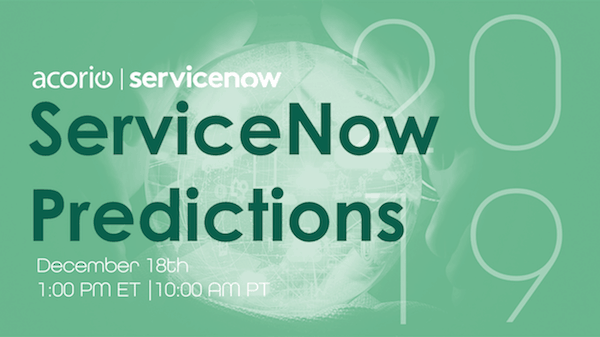 Register today to be a part of a virtual roundtable where our ServiceNow Experts discuss their predictions for 2017. 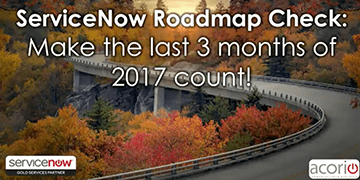 With just over 30 days left in the year, most IT leaders have their ServiceNow budgets and general goals laid out by now. How confident are you that you have the journey prepped, and your team set up for success? 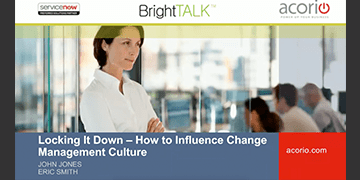 Have you incorporated the latest trends and insights into that planning? 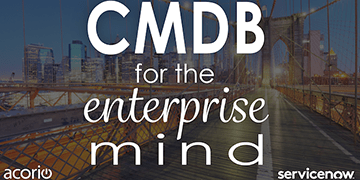 Join two of our CMDB experts on Tuesday, October 25th for an exclusive web clinic, and learn our secrets for getting CMDB right the first time. 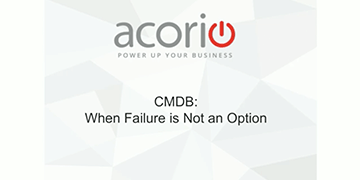 You invest significant time and resources on your CMDB, and failure is not an option. Sign up today and learn how to guarantee success. Unify your change management process and ensure your team gets the most out your technology to bring your business to the next level, and give you all the visibility you crave. 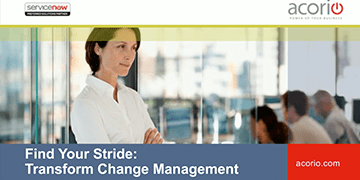 Join Acorio for an Expert Web Clinic to see how a cohesive approach to change management execution helps you eliminate confusion and streamline the often-fragmented pieces of your change management process. 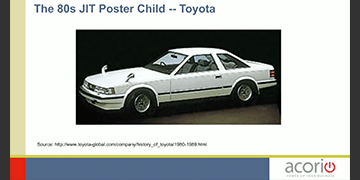 In the 80’s, companies were implementing ERP/Supply chain systems to reach the almost mythical philosophy of Just-In-Time (JIT) manufacturing - that meant zero lead time, zero inventory and zero failures. It was a radical approach to running a business that carried with it skepticism and confusion. When Dell announced that they had Zero stock on hand it was big news. But it inspired others. The accurate tracking of time is always a challenge. It becomes more of a challenge when it’s not easy to do or there is a lack of mobile input. 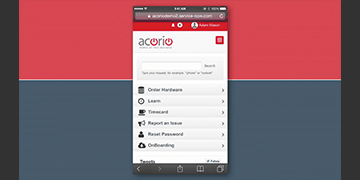 Acorio’s Timecard solution overcomes these challenges by providing a simple, modern interface that works in browsers and mobile devices. 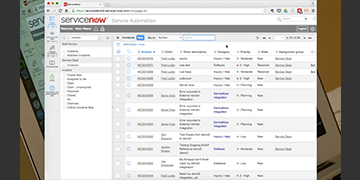 Timecards will enable your remote and local workforce to quickly input time across all projects and work in ServiceNow. 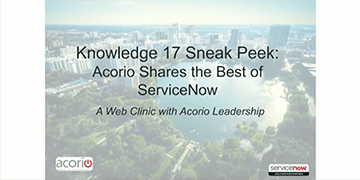 : Acorio’s KCS solution offers a shared knowledge/incident experience in a way that is designed to enhance utilization and eliminate points of failure in Knowledge Management.